고려 전기의 청자 향로로, 높이 15.3㎝, 대좌지름 11.2㎝의 크기이며 뚜껑과 몸통 두 부분으로 구성되어 있다. 뚜껑은 향이 피어올라 퍼지도록 뚫어서 장식한 구형(球形) 부분과 그 밑에 받침 부분으로 되어 있다. 구형 부분 곳곳의 교차 지점에는 흰 점이 하나씩 장식되어 있다. 몸통은 두 부분으로 윗부분은 둥근 화로 형태인데, 몇 겹의 국화잎으로 싸여있고 다시 커다란 국화잎이 이를 받치고 있다. 아래 부분은 향로 몸체를 받치고 있는 대좌로, 3 마리의 토끼가 등으로 떠받들고 있다. 대좌의 옆면에는 덩굴무늬가 새겨져 있으며 토끼의 두 눈은 검은 점을 찍어서 나타냈다. 유약은 회청색으로 은은한 광택이 난다. 이 작품은 상감청자의 일종으로 볼 수 있는데, 고려 청자에서는 드물게 다양한 기교를 부린 작품이라고 할 수 있다. 공예적인 섬세한 장식이 많은 듯 하면서도 전체적으로 조화와 균형이 잘 잡힌 안정감 있는 뛰어난 청자 향로이다. 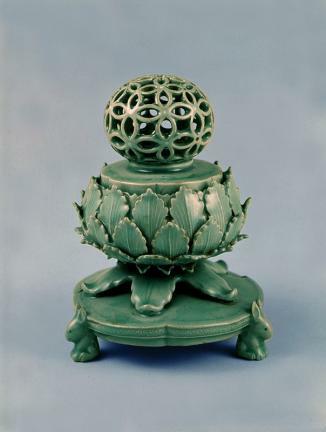 With height of 15.3 centimeters and pedestal diameter of 11.2 centimeters, this celadon incense burner -- made during the early Goryeo period -- consists of three sections: the lid, the body, and the pedestal. The lid is divided into two sub-sections, with the upper section featuring an openwork globe ornamented with a coin motif known as “seven-treasure design” (Chilbomun) and the disk-shaped lower section supporting the knob above. The body also consists of two sub-sections: the incense-burning bowl covered with chrysanthemum leaves and the feet shaped like chrysanthemum leaves, and the pedestal shaped like a tri-lobed disk supported by three rabbits whose eyes are rendered by black slip dots. The side of the pedestal is decorated with an incised vine design, whereas the openwork knob is further ornamented with white slip dots inlaid on the areas where circles are intersected. The entire body is coated with grayish-green celadon glaze emitting a soft luster. The use of various decoration techniques and the outstanding proportion and balance that create an increased sense of stability make the burner one of the finest masterpieces of Goryeo celadon potters.